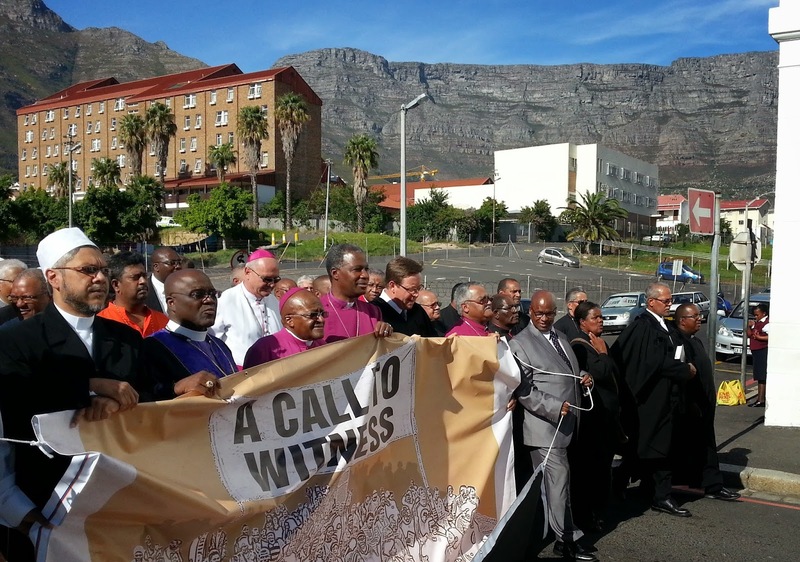 Today is a day we're issuing to all South Africans a “Call to Witness.” What does this mean? For me, I'm asking all South Africans to turn themselves inside out and expose their sense of moral consciousness to the sun. Why? Because, the sun is God's disinfectant. Because of the ethical state of the nation, we need to be morally disinfected... morally disinfected so that we can recapture the dream of South Africa. Over the last six months you have no idea how many thousands of South Africans have said to me, "Your Grace, I'm so very tired of seeing the moral pollution. I am so tired of seeing the pervasive unethical contamination. It is so painful to see the inequality." They ask. They plead: "Archbishop, we should be joyfully celebrating the 20th year of democracy and liberation, but I've never felt so depressed by the crisis of distrust in our country's government." They ask, "Where do we go from here?" 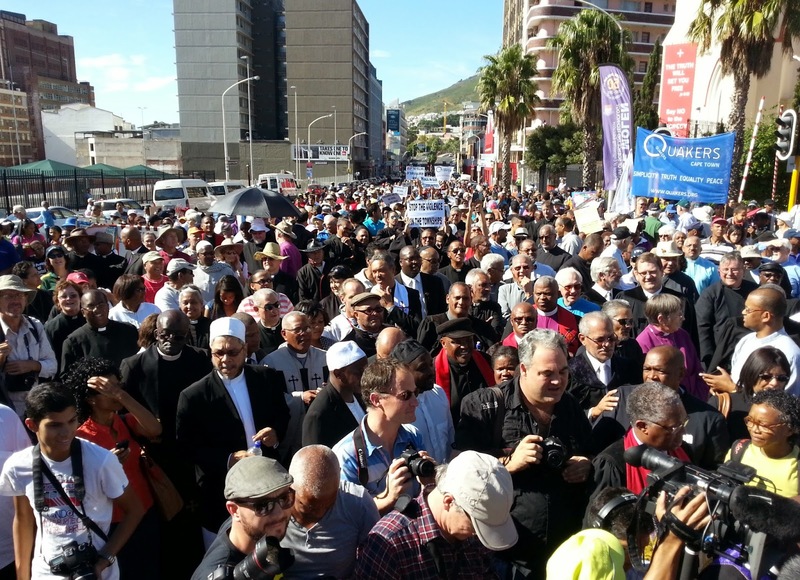 The welter of emotions our situation unleashes demands prophets for a time such as this. 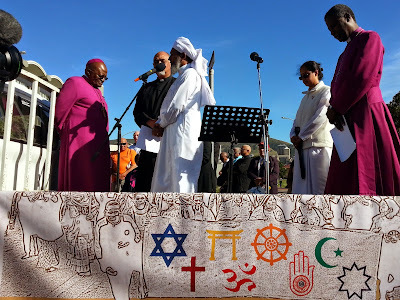 My hope, and the hope of my fellow religious leaders, is that in the next few days – over and above demanding explanations, which seem not be coming – you will start a national conversation around three essential questions. First, "How long must South Africa live out its daily existence suffering from such a lack of transparency? Real transparency is an essential ingredient for trust... the absence of transparency results in a withering, pervasive weight of distrust taking over. And one might follow up the first question by asking, "Is the distrust we feel for today's leadership more or less than the distrust we felt during the days of apartheid?" The cost of the lack of trust we are experiencing is incalculable. Elsewhere, I have spoken of the need for a Renaissance of Trust and Responsibility. When you disarm the people of our communities of their trust in our leaders, you not only offend them, but more seriously, you show our communities that you distrust them. You are either afraid of their values, or distrust their values. You are afraid of their ability to make informed, values-based decisions, or you distrust our constitutional values. You are afraid of their opinion or do not trust them to exercise their choices responsibly. You are afraid of their judgment, or do not trust them to apply their judgment. Or most seriously, you are afraid to let them question your actions and motivations, or do not trust them to understand your actions. So it is with the collapse of standards and values. What started as a trickle is now a flood. The wave of distrust is wiping out the incremental progress we have made on accountability, democratic choice and the rule of law. In the face of the nation’s questions to our President on the international embarrassment we call "the Nkandla question”, he has opted for silence. Unfortunately those advising him have forgotten the admonition: Silence screams the truth. This is not what our country wants from our President. It is not what our country needs from our President. And it is not what we voted for when we asked our President to take responsibility for our country's navigation. I, like many, want to believe our President when he said that he didn't rob our nation's treasury. But if he didn’t, did he hold the stepladder? If he did, sadly he's as guilty as the person who climbed through your window. 1. Mr President, how much longer do the citizens of South Africa have to wait to for you to explain how you came to make the decisions you made on Nkandla? 2. Mr President, which of our constitutional values did you use in making your decisions about the R234 million spent at Nkandla? 3. Mr President, what is your plan for responding to the historic levels of distrust that permeate every discussion about our national government? 4. Mr President, what is your plan for beginning a national conversation about our national values before the election so that every South African can vote their conscience? Mr President, our country deserves better. Our country's communities deserve better. Our families deserve better. Our children deserve better. You were elected to provide a moral compass for our nation. You were elected to be a model of a leader who makes values-based decisions. You were our hope. That's a huge responsibility. We need to hear the voice of responsibility speak. We're facing an historic opportunity and it's not the celebration of our 20th year of democracy and liberation. It is how you decide our destiny. It's in your moments of decision or indecision that our destiny is shaped. Mr President, how you are remembered in history, your legacy, is going to be determined by how you speak to the nation about how you made the decisions you have made. All the nation wants is a leader who sets an example by taking responsibility. A leader who is transparent. A leader who acknowledges imperfection, and who in acknowledging imperfection commits to a life as a values-based leader. Nothing short of that will be enough. Mr President and all of us listening today, now wearing my cap as an archbishop and of course a Christian leader: Easter assures us that it is at such heights of pain, despair, hollowness and distrust, that the risen Lord, the Christ, bursts anew into our lives to restore and transform them. Easter is a time of rebirth. Christ forgives the penitent, he heals the broken and gives hope to the hopeless. Easter is a time also for renewal. We are strengthened to offer ourselves in service of the common good, following the example our saviour set for us.